Sign Up For Your FREE Love Assessment ! 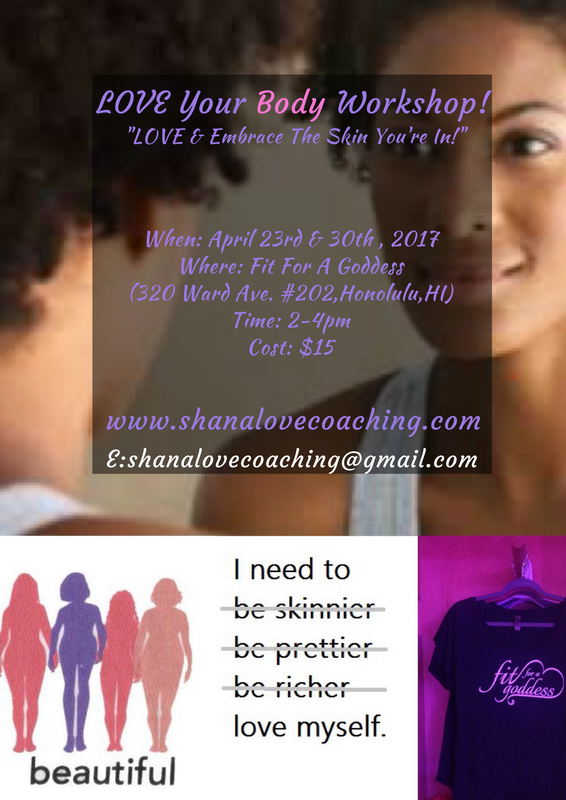 ﻿Welcome to Shana Love Coaching! I am a Certified Creative Love® Coach that assists individuals to grow more in self-love. I believe that self-love is the foundation in any and every relationships; and this is an area that is often overlooked. My overall goal is to help individuals to rediscover the love from within. When a person grows more in self- love, they will gain more clarity in love, life, and overall relationships. Are you a single man or woman, who is exhausted playing the dating game and ready for a true meaningful romantic relationship; and refuse to settle because you know that true love is possible? Are you an individual who like to grow more in self-love to experience a richer and satisfying life. Then I am the coach for you! However, I must warn you about the possible side effects of self-love. You may experience an increase in self-confidence, joy, happiness, self-acceptance, and occasional laughter. If you are ready to experience more love and to live your ideal life. Please sign up now for your complimentary Love Assessment (30 mins). I look forward to assist you in your love journey! • At this time of year, it can be easy to get caught up in the hustle and bustle of holiday shopping. While you are out shopping for everyone else, don’t forget to pick up a gift for yourself. When was the last time that you bought something for yourself that can enhance your inner beauty? Oftentimes, purchases are made to enhance the outer appearances, and our inner often gets neglected in the process. By investing in a coaching session will be a gift that will keep on giving. This season choose to do something different. LIBERATION from self-imposed beliefs, self-limitations, low self-esteem, can allow you to In order to give & receive LOVE more FREELY. 90 minute INTRODUCTORY coaching session. April Fools!! 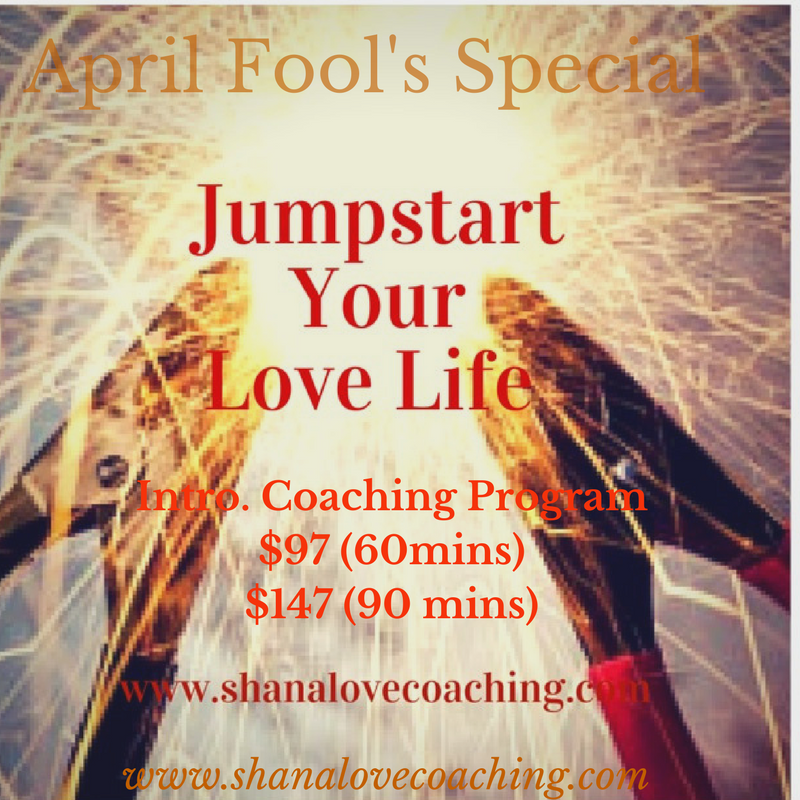 I’m offering a special rate of my “Love Jumpstart” for the month of April. This introductory coaching program are for those who want that SPARK in their LOVE and relationships. The “SPARK” you are seeking to get back in your LOVE life on track or want to create one, foremost, that SPARK begins within YOU (Self-Love)! Whether, you feel like you are in love limbo and want to get unstuck? Are you looking for a breakthrough in love? This brief coaching session can help you get clear in any area in LOVE, which, may be keeping you from the LOVE that you desire. If you are READY to get out of your way, RECEPTIVE to doing something new, and get different RESULTS. Then this introductory program is a great way to get started NOW! If you are ready to make your LOVE INVESTMENT to get clarity in your love life! ks below for your preferred session 60 min OR 90 min session. Love the website and great picture. I will be signing up for my 30 minutes. Love the theme and I wish you lots of success in your new found dream! love your website congratulation on your success may your dream be fullfill I know you can do whatever comes your way, I will be signing up.